So, you’re thinking about getting a new door. That’s awesome news! However, it’s important to think about front door installation as well. Installing a front door isn’t a DIY job and should be handled with extreme care. The question remains – what are you going to do about your door installation? You need to find a trustworthy company that can help you with your installation. But, there are so many installers in Madison, how do you know you’re getting the right one? Fear not, Feldco is here to help. We’ll teach you everything you need to know about front door installation so you can have a gorgeous entryway to your home. Let’s get started. You’re probably wondering why front door installation is so important. It looks pretty easy and you can probably do it yourself. That’s not the right attitude to have when talking about installing your front door. Your entry door is the first impression that many people see when coming to your home for the first time. You know what they say about first impressions – you only get one. Make your first impression count with a well installed front door. Not only that, but safety becomes a concern when your door isn’t installed by professionals. You can be victimized easily and put through one of the worst nightmares of your life. We’ll go into great detail below why front door installation is extremely important. When you get a replacement front door, the last thing you want to think about is maintaining it, especially right after installation. However, if your door isn’t installed by trustworthy professionals, you’re going to have a lot of expensive work on your hands. For starters, opening and closing the door will take significant wear and tear almost immediately. Not only will you have a sticking problem, but your door will be damaged. If this isn’t rectified quickly, the damages may be irreversible. 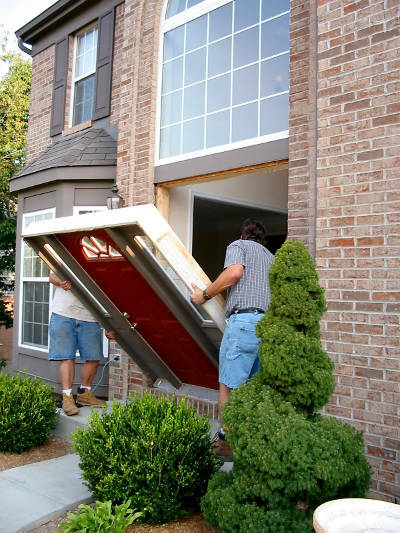 If you have an in-swing door, the problem could go beyond just front door damage. You could start to scratch and scuff your floor which could end up costing you tons of money to repair or replace. All of these problems could have been avoided with proper front door installation. One of the biggest benefits of a steel entry door is its durability. They’re built to withstand almost anything without crumbling and falling apart. However, that’s if they’re installed well. If they’re poorly installed, your door might as well be open to everyone. When your front door is installed properly, burglars can’t easily kick-in or knock down your door and get into your home. This won’t cause too much of a commotion either so your neighbors wouldn’t know something was wrong until it’s too late. As you already know, your front door is the first thing people see when they come to your home and when they leave. You want to make a great first impression which you can’t do with a poorly installed front door – it’ll just be ugly. Also, many doors have customization options that can help you create the door of your dreams. It’ll match the rest of your home and even give it a little more visual depth. However, none of that matters if your door doesn’t fit right or isn’t straight. Front door installation can make or break the beauty of your home. It even has the ability to affect your entire home’s curb appeal. One thing many homeowners forget is that your front door also protects you from the weather. Whether it be rain, snow, hail, wind or extreme temperatures, your front door needs to be able to handle anything Madison can throw at it. If your front door isn’t installed properly, then that’s not going to happen. There will be gaps that drafts can get into your home easily. Plus, water and snow will be able to seep in and cause a lot of problems around your entryway. But what does this all mean? Well it’s fairly obvious that having water leak into your home can cause damage to your floor, walls and door frame. Water damage is very expensive and isn’t something you want to deal with. However, less obvious is the effect it will have on your energy bills. Your furnace and air conditioner use power to reach your desired temperature. The easier it is for them to reach, the less power they use. When drafts are able to get into your home easily, then your furnace and air conditioner are in a constant battle to keep your home comfortable – oftentimes a losing battle. Not only will your home be uncomfortable, but you’ll be using more power, which will raise the cost of your energy bills. It’s pretty clear that front door installation is extremely important but how do you know you’re in good hands? What makes an installation company good? There are a few things you need to look into that we’ll go over below. Anyone with a truck and some tools can call themselves an installation company. That’s why how long a company’s been in business and its reputation play a huge roll on whether they can be trusted or not. Fly-by-night companies come and go quickly so you want a company that has stood the test of time. What’s an acceptable amount of time for a company to be in business? We suggest only look at companies that have been around for at least 10 years. Obviously, the longer they’ve been around, the more they can be trusted. If a company does good work, they’ll flaunt it. Why not – if they have the skills to convince you that they’re good, they should. This will also help put you at peace of mind and ensure you that the job they’ll do on your home will be the same level of quality. When a company isn’t being forth coming with previous projects, it’s a red flag. You should immediately ask to see previous work so you know what you’re in store for if you go with them for your front door installation. You also want a company that has done a large amount of projects in the past. Every now and then, a blind squirrel finds a nut. They may have one or two good projects but out of how many? You want a company that’s been trusted many times and delivers on their quality work consistently. When getting a replacement entry door for your home in Madison, don’t forget to consider front door installation. It can be the difference between having a beautiful, durable, energy efficient entry door or having a mess of costly maintenance on your hands. There are many installation companies in Madison so you have to be careful. Find a company that has been around for a while and has satisfied many customers. Feldco meets all of the criteria above. We’ve been around for over 40 years and have served over 350,000 homeowners. Not to mention that we offer high quality steel and fiberglass doors that are custom-made to fit your exact specifications. Get a free quote now and see why we’re Madison’s #1 door company.